Definition - What does Trikonasana mean? Trikonasana is a standing yoga posture that requires strength, balance and flexibility. In this posture, both arms extend with the legs spread apart and one foot turned at a 90-degree angle. The upper body bends toward the lead foot so that one arm reaches toward, but not necessarily touching, the ground and the other toward the sky. The term comes from the Sanskrit trikona, meaning “three corners” or “triangle,” and asana, meaning “posture.” The term is often used synonymously with utthita trikonasana (extended triangle pose). In addition to a range of physical benefits, trikonasana is believed to unblock energy pathways in the body. It is one of the basic poses common to the many styles of yoga. Trikonasana is commonly referred to as triangle pose in English. Depending on the school of yoga, there may or may not be a difference between the terms trikonasana and utthita trikonasana, but where a variation is noted is in the hand placement and position of the torso. Trikonasana is also similar to parsvakonasana, the difference being that the former maintains straight legs, while the latter is performed with the lead leg bent at a 90-degree angle. Baddha trikonasana (bound triangle pose), in which one arm wraps around the lead leg and grabs the wrist of the opposite arm behind the back. 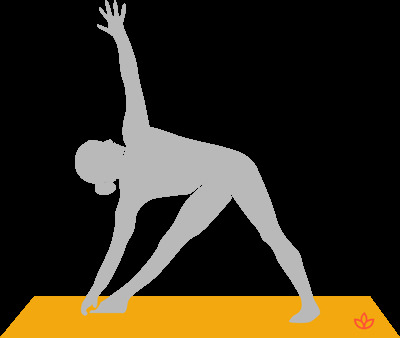 Parivrtta trikonasana (revolved triangle pose), in which the upper body twists so that the opposite arm extends to the ground. In Satyananda yoga, trikonasana is a series of asanas – usually four to five – performed in a sequence, but given the name "trikonasana." Trikonasana is thought to stimulate the svadisthana chakra. This chakra is the center of creativity, pleasure and enjoyment.